Classic Shell • View topic - What to do when IE features of Classic Shell won't work? Post subject: What to do when IE features of Classic Shell won't work? What to do when the caption doesn't show up? Run Internet Explorer and go to Tools -> Manage Add-ons. 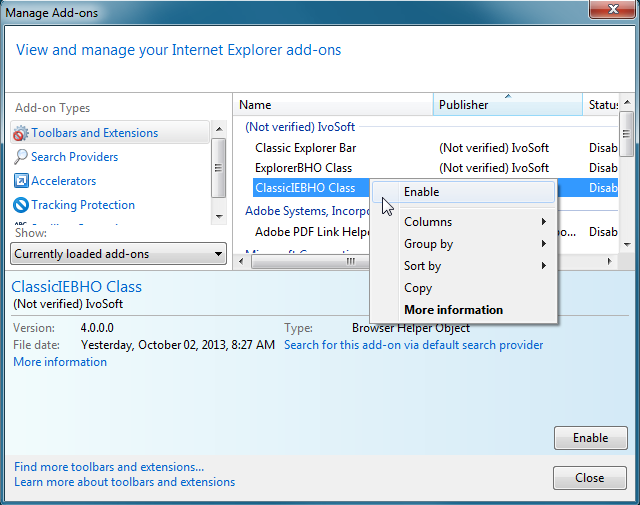 Find "Classic IEBHO Class" and make sure it is Enabled. If you are unable to access the Manage Add-ons dialog because Internet Explorer isn't opening or is crashing, then you can also open "Internet Options" from the Windows Control Panel. What to do when the Internet Explorer status bar features don't work? Same steps as above first to enable the IE addon of Classic Shell. Then press Alt+Space in Internet Explorer to show the window menu and check the Status bar if it is unchecked. 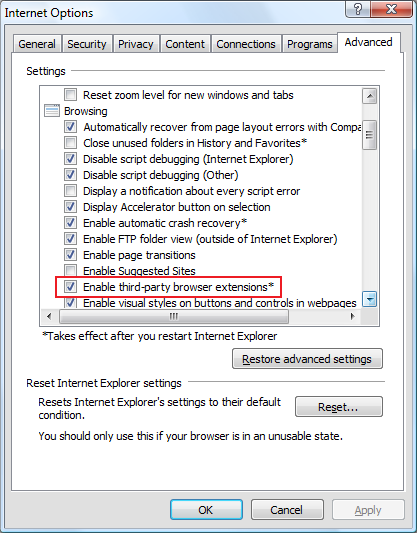 Do not try to enable the "Classic Explorer Bar" inside Internet Explorer. It's a toolbar for Windows File Explorer, not IE, but due to the shared addon model of IE and WE, it cannot be prevented from showing in IE's list of addons. For Internet Explorer, Classic Shell only adds a page title and status bar enhancements.